Some things have no substitute. I love sunflower seeds! 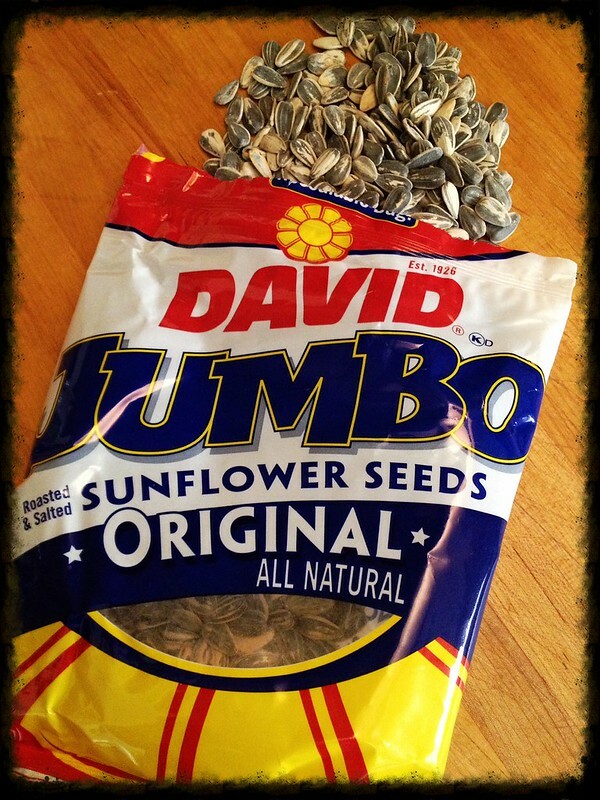 Jumbo sunflower seeds! David Jumbo Sunflower Seeds to be exact. They’re salty, crunchy, salty, have a great flavor and are salty. One day I ran out of these little morsels of saltiness so I stopped by a grocery store I rarely go to, simply because it was on my way home. I searched the snack aisle since that’s where I am used to finding them…between the Ruffles and the Doritos. Nada. So I hunted down one of the employees and asked “Where can I find the sunflower seeds?” To which she replied “OH! They’re in the produce section. (which should have been my first clue) Here, I’ll show you.” So…we moseyed over to where they were…a brand I hadn’t heard of. I asked, “Hmmm…you don’t have David’s?” She said “No. But these are much better! You’ll love them. As a matter of fact, they’re so good, you’ll be back to get more!” Well…I was under a time constraint and since not having sunflower seeds was not an option for me…I bought 2 bags. Later in the day, the need for that salty goodness was more than I could bear so I broke open a bag. They were small (bad), soft…which as any sunflower seed connoisseur will tell you, is not a good thing when it comes to cracking them open…and they were not salty (worse), which defeats the purpose. IOW…they were no substitute for David Jumbo Sunflower Seeds. We see substitutes, in general, throughout life…one teacher will substitute when another is sick. Athletes substitute for an injured teammate. And so on. These are substitutions we understand, comprehend and are acceptable. Due to certain conditions, we become accustomed to substitutions. However, there are some things in life that have no substitute. Christ’s substituionary atonement has no rival. Romans 5:6(AMP) While we were yet in weakness [powerless to help ourselves], at the fitting time Christ died for (in behalf of) the ungodly. John 15:14(AMP) You are My friends if you keep on doing the things which I command you to do. Luke 11:28(AMP) But He said, Blessed (happy and to be envied) rather are those who hear the Word of God and obey and practice it! 2 Timothy 2:15(AMP) Study and be eager and do your utmost to present yourself to God approved (tested by trial), a workman who has no cause to be ashamed, correctly analyzing and accurately dividing [rightly handling and skillfully teaching] the Word of Truth. Luke 18:1(MSG) Jesus told them a story showing that it was necessary for them to pray consistently and never quit. Jeremiah 33:2-3(MSG) “This is God’s Message, the God who made earth, made it livable and lasting, known everywhere as God: ‘Call to me and I will answer you. I’ll tell you marvelous and wondrous things that you could never figure out on your own. As Believers, the enemy of our faith uses everything he can muster up as a substitution for what is Holy and Righteous. Worry, abilities, work, service, relationships…any and every distraction. We need to guard of our hearts and be diligent to not allow the enemy to insert substitutions into our lives. He is relentless in this endeavor. May God grant us the wisdom to confidently stand on His absolutes and courageously alter our opinions/convictions to match up to His word.